Circle-a round plane figure whose boundary (the circumference) consists of points equidistant from a fixed point (the center). Diameter-a straight line passing from side to side through the center of a body or figure, especially a circle or sphere. Radius-a straight line from the center to the circumference of a circle or sphere. Chord-a straight line segment whose endpoints both lie on the circle. 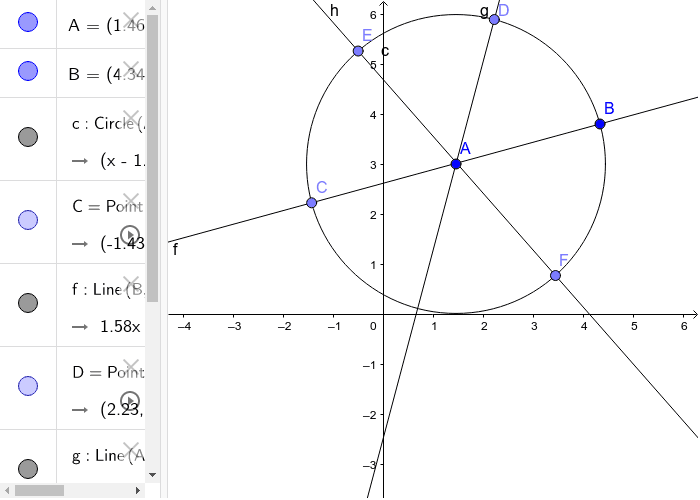 In a circle, a radius perpendicular to a chord bisects the chord. In a circle, a radius that bisects a chord is perpendicular to the chord. In a circle, the perpendicular bisector of a chord passes through the center of the circle.